Perhaps the most recognizable hybrid car on the planet, the fuel-efficient Toyota Prius delivers up to 54 mpg city, high-tech connectivity via the available Entune infotainment system, and integrated Toyota Safety Sense™ (TSS) technology to keep you secure on your hectic Mission Hills-area drive. Compare the Prius to the Prius c, and then browse our online inventory today! 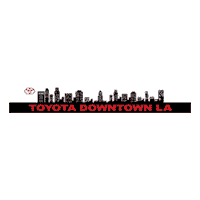 Then read on to learn why, if you want a great deal and next-level support for your new car purchase, Toyota of Downtown Los Angeles is the natural choice. Research Your New Toyota: Our tools help Huntington Park-area drivers compare trims, features, and equipment, so you get the right vehicle for your needs. Compare Leasing vs. Financing: Which option makes more sense for your driving style and budget? We have the answer! Apply for Credit: Value your trade, calculate your payment, and apply for financing when it’s convenient for you. Make the Most of Your Purchase: We offer information to help you squeeze even more mpg from your hybrid and reduce the cost of that upcoming road trip. Learn more about the many ways a Toyota Prius from Toyota of Downtown LA can improve your driving life. Explore our Prius specials, and schedule a Cerritos-area test drive today!